Nintendo has a history of sexually ambiguous characters, most due to the fact that they tend to be rather genderless. 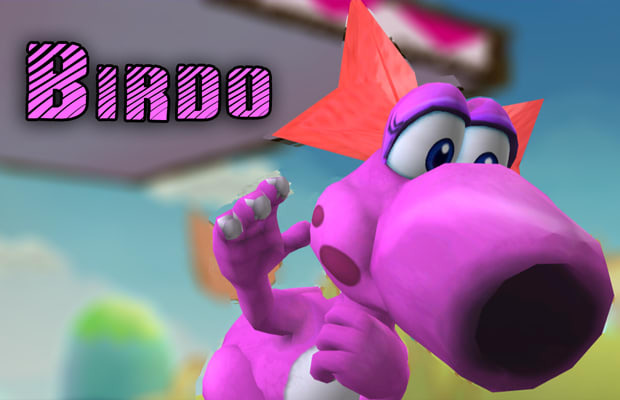 Birdo on the other hand definitely appears to be a woman, complete with flirty eyelashes, a pretty ribbon bow, and the ability to produce eggs. However, according to the original manual for Super Mario Bros. 2, Birdo is in fact a boy. The effeminate dinosaur wants to be a girl so badly, in subsequent games she's requested people call her "Birdetta". Though Nintendo has shied away from declarations on Birdo's gender either way, the 2008 Japanese-only release of Captain Rainbow had the character played by a male voice actor. A gag was even made about the notorious ambiguity in which the titular hero must get Birdo out of jail after she was arrested for using the ladies' washroom by proving she's a real woman. How exactly do you do this? Go to her home and find her buzzing...massager.